Is the thought of organising a Christmas get-together already making your pulse rate rise? While some relish in the organisational whirl of shopping, menu planning and festive decorating for most of us getting through to the end of the Christmas break without a major upset is achievement enough. I’m not suggesting we all abandon the home-spun side of Christmas but taking the pressure off the key moments, by letting a team of professionals take charge, has to be worth some serious consideration. Perhaps 2014 is the year to let others take charge of the turkey, abandon all dish-washing duties and instead plan to be pampered and indulged by the award winning team at Stoke by Nayland Hotel, Golf & Spa. Earlier this year two of their young chefs and a waiter led by Executive Head Chef MCGB Alan Paton, won the national award of Young Restaurant Team of the Year 2014. They fought off some stiff competition which included last year’s winners and the winning team of Martin Lane and Jamie Mallett, both talented Chefs de Partie and Jack Butler who excelled as a star Waiter are all just 21 years old. It’s clear from the moment you walk through the doors at the hotel that they’ve been cultivated in an environment where ensuring customers enjoy a consistently excellent experience is the focus. If you’ve not had the chance to pass through the doors lately you’ll also see that this year the team at the family-owned Stoke by Nayland Hotel, Golf & Spa has undertaken a substantial refurbishment of its main entrance and Reception area, as well as the Hotel Lounge and many of its bedrooms. Already an AA 4 star hotel, the venue has also now been upgraded by Visit England to 4 star Silver status too. The elegant décor and furnishings, all designed by Lindsey Rendall of Rendall & Wright, take inspiration from the fruit farm surrounding the Golf Course creating a tangible link between these two elements of the family business. The Reception Lounge is the perfect spot to treat yourselves to Afternoon Tea or meet friends for pre-dinner drinks and relax into your festivities. This Christmas there’s a number of well thought out packages to choose from. The idyllic Christmas breaks over two, three or four nights – including the big day itself – all include the chance to relax by the roaring applewood fire, pamper yourself in the Spa, play golf, enjoy live music and games, or simply wrap up warm and stroll through stunning Constable Country. For those who feel that everything grinds to halt once Boxing Day is done there’s a special ‘Twixmas’ Break that abandons all thoughts of TV re-runs and leftovers and instead includes the popular Comedy & Curry Night. There’s a New Year’s Eve Gala Ball on the 31st for just £89 per person and this includes a welcome glass of bubbly and canapés on arrival, a sumptuous five course dinner with all the crackers, balloons, streamers, party poppers that you’d expect and even a free prize draw. With a special rate available for overnight accommodation too, early booking is highly recommended. Even if family commitments mean that a Christmas away from home is near impossible why not let your hair down with friends or colleagues at a Classic Christmas Party Night? The evening includes a delicious three course festive menu, a free photo-booth to capture the fun of the evening, a DJ with dancing and even a free prize draw too. Available Fridays and Saturdays throughout December at just £39.95 per person and with the chance to book overnight accommodation which includes complimentary use of the pool, sauna, steam room, Jacuzzi and gym and Full English breakfast all for just £39.95 per person - you’ll think Santa’s made an early visit! Of course central to all of the celebrations will be food. Packed with many of Alan Paton’s signature flavour and texture combinations, a small but dedicated posse from the Essential Suffolk team were invited to sample the menu for ourselves. The Christmas Party Night and Festive Dinner Menu offers four choices at each course. To start there’s a warming cream of vegetable soup with thyme and garlic, a seasonal goat’s cheese salad with figs and walnuts jewelled with pomegranate and mint crystals but we were tempted by Atlantic prawns with Asian flavoured salad and the barbecue pulled pork terrine. The prawns are deliciously nestled in a fresh, crunchy salad that zings with ginger, all brought together with a nutty sesame dressing. Pulled pork is certainly in vogue and this terrine, teamed with bacon and cranberry jam is an out and out winner. There’s no prize for guessing that one of the main course choices is turkey. An East Anglian beauty replete with bacon rolls, sage and onion stuffing, roast potatoes and all the rest will keep the traditionalists among you happy while vegetarians are well catered for with parsnip, honey and chestnut roast loaf. Our choices of 12 hour braised beef shin with peppercorn sauce and baked fillet of sea bream proved great alternatives; the beef was so tender it fell apart at the lightest touch and although the essential Brussel sprouts weren’t available for our rather early visit they’ll sit very nicely among the other seasonable vegetables. The sea bream pulls away from the traditional though as it’s served with a Moroccan spiced lentil and chickpea casserole and is packed with flavour. Side stepping the very tempting Christmas Pudding and cheese options we chose mulled wine trifle and a chocolate choux pastry dessert. The trifle looked like Christmas in a glass – rich, red, wine soaked fruits, golden spiced cherry custard and green candied pistachios topping the cream – and as we dug through the layers the pistachios tumbled down to give a satisfying crunch to every mouthful. The choux buns were truly indulgent; generously filled with cream cheese and praline mousseline and topped with white chocolate sauce - an evening of dancing would certainly be in order to work of a few calories – especially as there’s still coffee and mince pies to come! 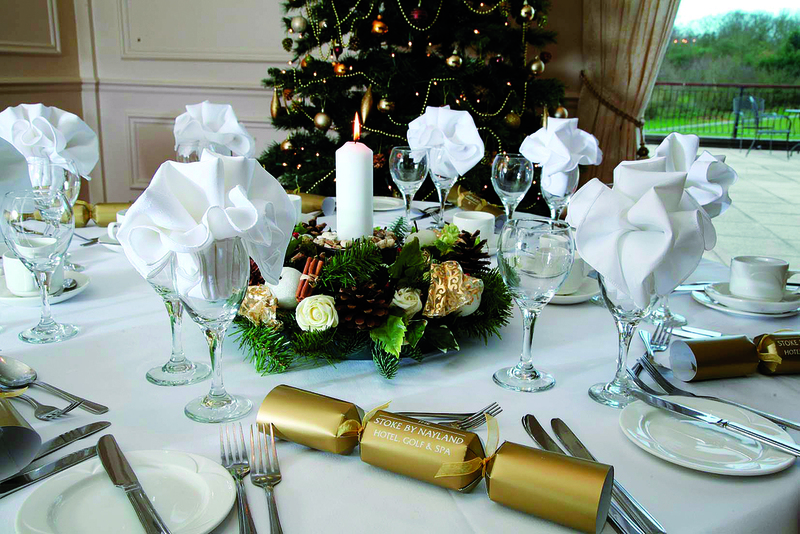 For more information about any of the packages available this Christmas visit www.stokebynayland.com or call 01206 262836.